Whilst identifying things is very important, what is an order of magnitude more important is how those things are related. Understanding how things relate allows us to ask questions of the information more than just simple “give me a list of…” type questions. The negative aspect of this is that the lines are much much harder to create and maintain than the boxes, which probably goes a long way to explain why in general they are not. The value that can be obtained and the difficulty in maintaining the information increases because the number relationships (lines) between things tends to increase in a polynomial fashion (using the formula n*(n-1)/2) which is a fancy way of saying that while the number of things rises linearly, the number of possible relationships (combinations – not permutations) between them rises faster and faster. In fact this also illustrates one of the problems with the adoption of The Architecture Paradigm™. The red line could be thought of the value that is created over time, which can be seen to be very low initially and a good increase in value only happens later as the volume of information builds up. In this world where management insatiably calls for the picking of low hanging fruit and quick wins, anything that takes time to provide value tends to be seen as worthless. 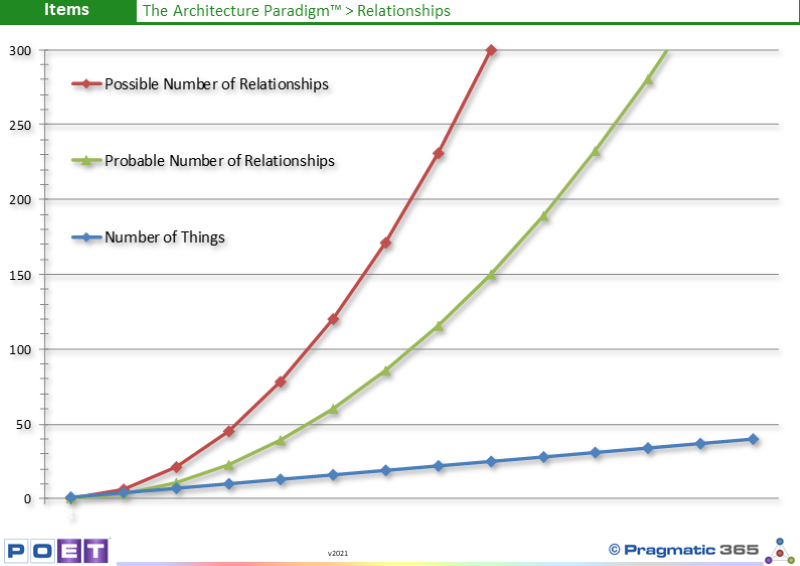 How much time is spent in your Enterprise understanding and maintaining relationships? What problems exist with documenting and maintaining relationships? Who should be responsible for maintaining relationships? Are people in your Enterprise given the appropriate time and resources to find, model and maintain relationships?